It's an amazing eye-opening thing to review the actual life of Jesus Christ. To see what He did proclaim — what He did preach. To open our eyes to what really did happen — and what He did teach and proclaim. What was His gospel? 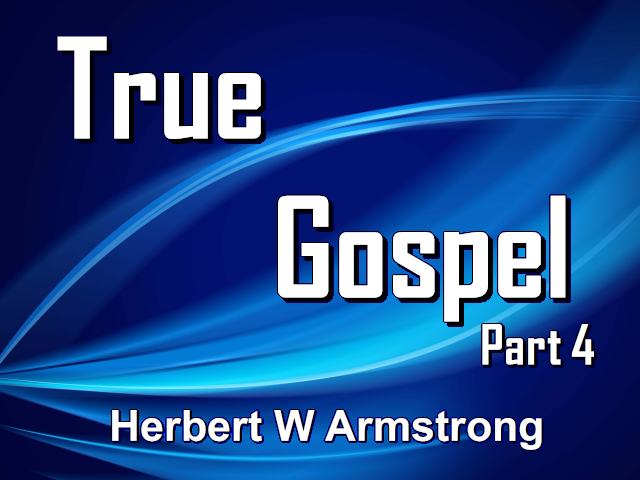 Because the gospel of Jesus Christ is not man's gospel about Christ, it's the gospel Jesus himself brought from God. The gospel He proclaimed. That is the gospel of Jesus Christ. Well I want to begin clear back in prehistory — long, long before Jesus was born. This might have been millions of years for that matter, because we have no idea how long it was — billions and billions perhaps. And that is the beginning in the book of John in the New Testament. Now let me explain that just a moment. The 'Word' is translated from the Greek language; it was written originally more than 1900 years ago in the Greek language. Now we just have a translation in the English language. So they translated the Greek word as it was — 'Logos' — into the English word, 'Word.' Well that's exactly precisely what it means. It means the spokesman, but it's a personage, and that personage was called here the Word. That's the name of the personage and that personage, the Word, was with God. Now God is a personage, so now you have one personage — the Word — with another personage — God — and you have two personages and they were together. And they both are immortal and they both have existed forever. There never was a time when they did not exist. No father, no mother, no beginning of days — always self-existent. My mind can't contain that, can yours? I'm sure it can't. You can't think of that, someone that has always existed. But we find life on this earth, in the world; we find animal life; we find plant life; and we find human life. But life can come only from life. That's the first law of biogenesis. That is a scientific law. There had to be life at the beginning to beget life and to create life in other types of beings. The only human ever begotten before His human birth by God — He was not begotten by a human father. He was begotten only by Almighty God who was His Father. And a human being named Mary was His mother. But God and God alone was His Father. Now it wouldn't mention the law here if it were all done away. It's mentioning only and referring to the spiritual law. Jesus didn't start that, Moses did, but Jesus carried it on. And He set us an example that we should do as He did and He said that very plainly. Jesus kept His Father's commandments. The law was given way back in the time of Moses. The law had existed from the time of Adam, but it was not put down in a code form until the Ten Commandments were given at Mt. Sinai. One of the purposes Christ came was to declare the Father. Do you know that the God of the Old Testament is not the one who is the God mentioned here? The God of the Old Testament is the one that became Jesus Christ. Not very many people know that, but there are many, many passages in the New Testament where it quotes Jesus and it quotes the Old Testament and it shows it was talking about Jesus when it was God speaking, but it was talking about the one who did become flesh and who dwelt among us. So Jesus is one, who with God the Father, had always existed. There never was a time when He did not exist. Now in Ephesians the third chapter you will read how God created all things, but He created all things by Jesus Christ. You know, it was early in January of 1914 when I was touring in the editorial department of a national magazine and I was sent at that time on the next train, because we didn't have airplanes to ride in in those days, to Detroit to interview Henry Ford with his five dollar a day wage plan. I saw Henry Ford, he was wearing a business suit, but he is the maker of the Ford car. Now I saw him in a breezeway between the office building and the big factory. At that time the factory was out on Highland Avenue in Detroit. In the factory I could see hundreds upon hundreds of men in overalls and they were working. But they were working with machinery and with the power of electricity. Henry Ford employed them, he made the Ford car, but by them. God is the Creator, God created all things, but by Jesus Christ. And it is the spirit of Christ — the spirit of God — the spirit that emanates from God the Father and also emanates from Jesus the Son — that, that is He became the Son as a human being — which simply did whatever Jesus said. He is the Word. One of the Psalms says: "He spake and it was done" (Psalm 33:9). That is the way everything was created that was created. Now just a bit about the birth of Christ and the purpose. Did you ever stop to think why did Jesus come? Why on earth did He come to this earth? Most people never think about that. You just read He did and you don't think why or for what purpose. You just never think of that. Well I think it is about time we look into that and think a little bit about it. Now you'll find in the book of Luke in the very first chapter beginning with verse twenty-six and onto verse twenty-seven it was "...in the sixth month [that was in the sixth month of the birth of John the Baptist actually, I'm not reading the words in the verses that went just ahead of that, that explain it]...the angel Gabriel was sent from God unto a city of Galilee, named Nazareth, To a virgin espoused to a man whose name was Joseph, of the house of David; and the virgin's name was Mary" (Luke 1:26-27). Now that is speaking of the one who became the mother of Jesus Christ. Oh, He is going to sit on a throne. Have you ever heard Jesus was born to be a king? You think He just came as a Savior and a lot of people think He came as an insipid weakling of some kind wearing long hair. He didn't wear long hair. The Bible plainly tells you that. Now, "And he shall reign over the house of Jacob forever; and of his kingdom [a kingdom, an empire, or a government] there shall be no end" (Luke 1:33). Of His kingdom there shall be no end. Think of that, a child is to be born and the government shall be on His shoulder; you don't hear much about Jesus Christ as a ruler over a government. I'm going to show you something you haven't heard very much about, about Jesus. It's in your Bible. In other words God had begotten the child that was in her womb. "And she shall bring forth a son, and thou shalt call his name JESUS: for he shall save his people from their sins. Now all this was done, that it might be fulfilled which was spoken of the Lord by the prophet, saying, Behold, a virgin shall be with child, and shall bring forth a son, and they shall call his name Emmanuel, which being interpreted means [is] God with us" (Matthew 1:21-23). In other words He would be God in the human flesh; God in the human flesh. Now I want to turn back once again to Isaiah, but this time back to the seventh chapter of Isaiah and verse fourteen. Now here is the very scripture that was quoted in Matthew. Now 'Immanuel' means 'God with us' and He shall save His people from their sins as the angel gave it in Matthew. So I want you to notice the duality. I have often mentioned that almost everything in God's creative plan and design is dual. There is a first and a last and so far as we are concerned on earth the first is usually physical, the second is spiritual. There is first Adam — Christ is called the second Adam. And there was the Old Covenant, which was all physical and national and material. Then there is the New Covenant, which is made with Israel; which will mean a spirit nation and will rule the whole earth and not just one nation. And it's a different thing altogether. So here is the duality, Jesus was born to be a king on the one hand and rule over a government. Jesus also was born to be a Savior and to save the people from their sins. Now the two have a connection together and there is a great connection, because once the people are saved from their sins, they are reconciled to God and God has immortal life, and eternal life to give us, so that we can know that we are ourselves going to receive the Holy Spirit and be begotten by God's Holy Spirit. In a different way than Jesus was, but become just as much God as He is, only not of the same power. Not of the same rank, not as high in the government, if you please. But Jesus came to rule and to qualify to rule the government over the whole earth and also to save the people from their sins; that we could have salvation — we could be given the gift of eternal or immortal life. So many people in the Christian world talk about being saved or lost, and by being saved, a lot of them think it means going to heaven. No — it means being given immortal or eternal life. Now, God is reproducing Himself, not very many people know that. That is the purpose of human beings. That is the great fantastic — almost unbelievable possibility of human beings, that God is reproducing Himself. It is a fantastic thing. Now here is an amazing thing; a duality. God is reproducing Himself. He is going to save us from sin and secondly He is going to give us eternal life. And that life comes from God the Father, but it comes not by Jesus' death, but by His resurrection. And very few people understand that. Now He came saying two things, you repent of your sins. He died to forgive us our sins and to pay the penalty in our stead. So He said repent, but He also said believe, believe what He said. Believe He came to rule and to be a king and that we can rule with Him. You know He says that if we overcome, we will sit with Him on His throne. If we overcome, if we have repented of our sins, if we believe Him; believe in Him and believe what He says. We shall be given power over the nations and rule them with a rod of iron — that is in Revelation 2:26 and Revelation 3:21 and 22. And you can turn and read that. Now I would like to read to you again in Matthew. I see time is slipping and I am not going to have time to say everything that I wanted to say on this program, but back in Matthew the fourth chapter. Mark just gives a little bit about the temptation of Jesus by Satan, and that was so very important. There had been one sitting on the throne of this earth. His name originally had been Lucifer; a great archangel. But he had rebelled against the government of God. It was a government over ALL the earth and that Lucifer, that great super archangel, his name was changed to Satan. He is called Satan the devil — there is a lot about him in the Bible. Now I know, my friends, it is not very fashionable today to believe there is a devil. A lot of people would ha, ha or laugh about that. Your Bible says a lot about it. And the very people that laugh are being deceived themselves by that Satan. There is a lot about it. Jesus came to conquer that Satan so he would be removed and so he would not be deceiving the nations of this world anymore. I want to read it to you in the fourth chapter of the book of Matthew. Have you ever fasted even two or three days? Your stomach really begins to bother you before the first day is over. And He had fasted forty days and forty nights. A lot of people think you couldn't do that, well it has been done. In other words "I don't believe you're the Son of God, now prove it to me. Take stones down here and perform a miracle and prove to me that you are divine, that you are the Son of God." If Jesus had obeyed him, He would have been obeying Satan. In Luke I think it is, it is explained "by every word of God" (Luke 4:4). So Jesus obeyed God and resisted the devil and He won on that point. Now think of someone who had fasted forty days and forty nights. The greatest temptation could be to perform a miracle. He had tempted Him on a point of vanity to prove He was God. Most human beings would have said — "Well, am I the Son of God? I'll tell you I am, I'll show you who I am! ", and they would have just performed such a miracle, if they'd had the power. But Jesus didn't; He didn't have to do that. He said, "I will obey God — you shall live by every word of God on spiritual food as well as physical." Now the devil had given Him the strongest temptation, just about you could, "Then he taketh Jesus into the holy city and setteth him on a pinnacle of the temple" (Matthew 4:5 paraphrased). That's some height up above the ground. Now Satan began to quote scripture! Oh yes Satan knows the scripture, but he never quotes it correctly. He misquotes it and he's got plenty of people on earth misquoting it today too. Again, Jesus did not fall for that temptation. "Jesus said unto him, It is written again, Thou shalt not tempt the Lord thy God." (Matthew 4:7) And that is precisely what Satan was doing. All the governments, the nations, the kingdoms — now we are getting back to a nation and a kingdom again! Satan was sitting on that throne; he is yet today right now. HE IS SITTING ON THAT THRONE AND HE DIDN'T WANT TO BE KNOCKED OFF OF IT. JESUS HAD COME TO TRY TO CONTEST THAT. The first Adam had the chance and he muffed it. Now Jesus is come -the second Adam — a spiritual Christ. This is the greatest contest that ever has been undertaken by any human who has ever lived! And it was for the greatest stakes that anyone ever fought! HERE WAS THE BATTLE OF ALL BATTLES. And Satan knew it; he was sitting on the throne and he didn't want to lose it. Now Jesus took command, and He gave an order; a command — He said "You get hence, get out of here!" and Satan slunk away. Jesus Christ had won that battle. THAT WAS THE GREATEST BATTLE EVER FOUGHT IN ALL THE UNIVERSE — no battle had ever been fought like that before. But Jesus won that battle. That is the kingdom Jesus came for. He also came to save us from our sins, to give us eternal life that we can reign and rule forever with Him. That's the purpose for which Jesus came. Not just to have you go to heaven — have nothing to do for ever and ever, but just look on the face of Jesus. You know idleness would be the most tiresome thing you could ever get into, if that is what was Jesus' real gospel; but it isn't. You will find in Revelation 11, verse fifteen, how the kingdoms of this world will have become the kingdoms of our Lord and His Christ. And Jesus is coming to rule all the nations of this earth. There is so much more to it and we are in the time leading right into the time now — it is coming in this very present generation. Now I want to offer you a very important booklet. 'Just What Do You Mean — The Kingdom of God?' 'Just What Do You Mean — The Kingdom of God?' You know some people think the kingdom of God is the church. The church is not the kingdom of God. The Church of God is going to be born into and become the kingdom of God, but it is not the kingdom of God now. The kingdom of God is a government. This booklet will give you so much more than I have had time to do on this program. And I'd like to give it to you. Now there is no charge. There is no follow up asking for money. We just don't do that and I'd like to give it to you, because we believe in giving not in getting. And we are not going to ask you pay for it or to send any contributions, unless you send in yourself, voluntarily we are never going to ask you. I don't know of anybody else that's doing it like that, but that's the way we are doing it. That is the way God would have it and we are trying to obey Him and live His way. This booklet 'Just What Do You Mean — The Kingdom of God.' Now there is no charge — we will send it to you gratis and I'd like to have you just ask for it. So until next time, this is Herbert W Armstrong saying, Goodbye friends.